I swear, I really didn’t mean to have shaved asparagus for three out of the four recipes I’ve posted in the past week. I was really planning on topping these little guys with something else (maybe roasted radishes?) but I’m picking up produce on Tuesday from the CSA, which meant I really didn’t want to go to the store. My fridge looks bare, except for close to three pounds of asparagus. I could make at least ten meals with the asparagus I have. So, I’m sorry, but there are worse things to have too much of, right? 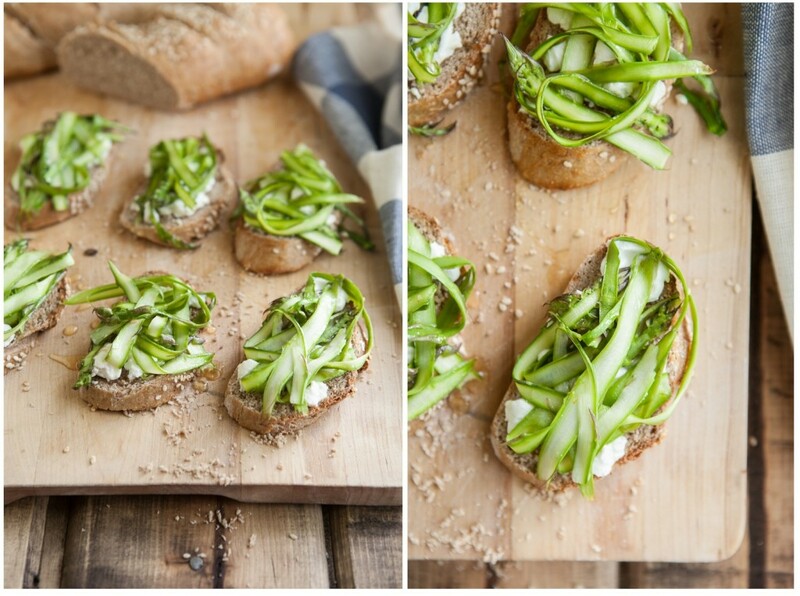 If it’s any consolation for my blog being overrun by asparagus, these crostini are delicious. Almost addictively so. For the baguette (and bread recipe) hope over to Melissa’s blog (and while you’re at it, look around a bit-she’s just lovely!) For everyone else’s take, pop over to the Food Matters Page! Shave or thinly slice asparagus. Toss with 1 tablespoon of olive and salt. When ready to serve, lightly drizzle honey over asparagus. I love these so much and I don’t think you should ever apologise for another shaved asparagus recipe! 1) I love shaved asparagus. 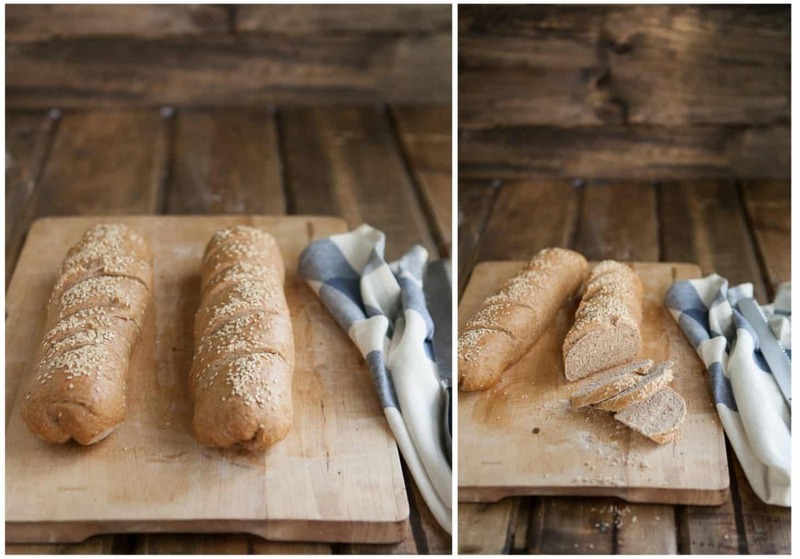 2) Your baguettes look much, much prettier than mine. 3) Thanks for the Saveur shout-out! Now that asparagus is in season, I think I could eat it every day. So I really understand. So much asparagus is what I love about this time of the year. Your baguettes look great. I’ve never shaved asparagus before… I think I’ll test that out next time! And I bet asparagus tastes amazing with goat cheese (I’m obsessed), thanks for the great ideas!! I buy goat cheese sparingly but I forget how good it is! After seeing posts where veggies are shaved, I wanna it too… It looks so pretty and classy. Love all these toppings and love how rustic your baguettes look. I wish we were roomies. mmmmm…shaved asparagus. I’m going to copy you!!! YUM. Light and easy to assemble- I love the combination! I had to laugh at your comment about the Tuesday CSA pick-up and the bare fridge – we’re living parallel lives. 🙂 I can hardly wait – fiddlehead ferns this week, yay! These crostini look delicious – now on my ‘to make’ list. Thanks! Hey, why not eat lots of shaved asparagus all the time? It’s definitely the season for asparagus–get it while it’s good! These look delicious! I’ve got to start cooking with asparagus more often. Gorgeous photos! There is nothing wrong with enjoying lots & lots of asparagus 🙂 I’ve been using it in everything too. It’s so so so delicious! 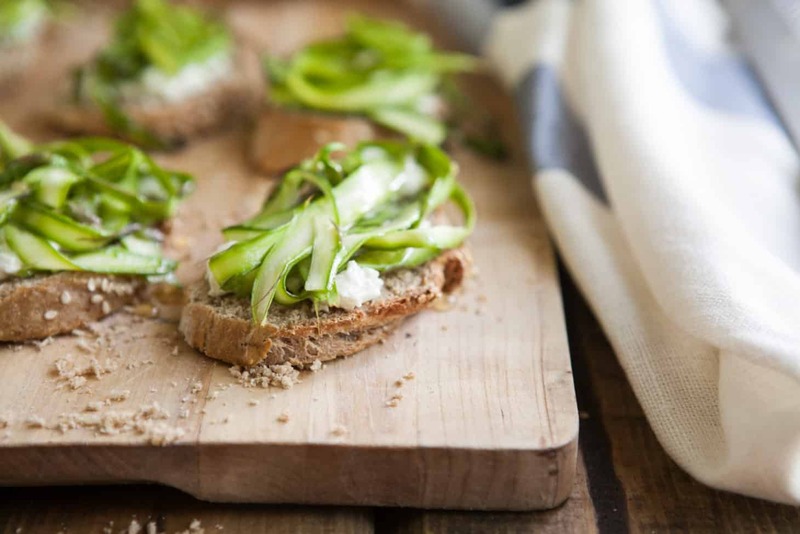 These crostinis look fantastic – so bright & fresh. Thank you, Kasey! I agree and I can’t wait to get my hands on some avocado- everyone is taunting me with it! This looks delicious- I might have to make something like this for our next book club! We’ve been eating more asparagus lately as well (3 days in a row now!). Yesterday I ate it three meals in a row 🙂 Can’t get enough! I <3 asparagus so I'm not mad at you – YUM! Great idea on the sesame seeds – I bet that was delicious. I’m in love with sesame seeds-I put them on everything! I am all over asparagus! And especially shaved. Gorgeous post! What kind of razor do you use? My electric shaver is of no use. Beautiful pictures. I could eat topped toasts for every meal – and this one sounds fantastic. 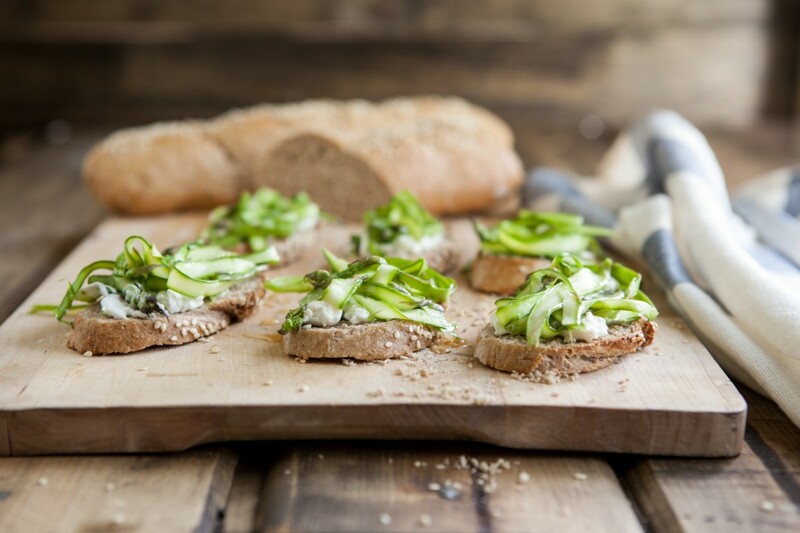 Asparagus and goat cheese are a match made in heaven. The pictures are very lovely. It exudes tranquility. I’m always on the lookout for new ideas for asparagus. Thanks for sharing!